Playmaker Bug Reporting / PoolManager Actions broken by update? Playmaker Help / Use playMaker global variable in script? I'm trying to work out how I can access a global variable from playMaker in one of my scripts. I'm trying out the Geosophic leaderboards plugin but it has no playMaker support. So basically, I have an int variable called ScoreCombineAll and I need the int score variable from my script to use that value. How would I manage this? My expertise with this kind of scripting is... not good. This came up recently and I'm not sure what I updated to cause it. Suddenly all my spawners are spitting out additional enemies. The FSMs for these spawners have not been altered in months, so something strange is going on here. My spawners basically set a random spawn interval, wait out the interval and then spawn the enemy; the process is then repeated. Frequently these spawners are creating two enemies simultaneously, though. Not sure if this is a bug or intended functionality but I don't seem to be able to store a component as a variable and set its properties multiple times. The setup works fine the first time the enemy dies, but when I respawn it (using PoolManager), setting the property on the component has no effect. The object value of the variable appears to be set correctly when everything starts going wrong, but maybe it's still storing the component that I destroyed on the first run through and which no longer exists? There's either something going wrong with Get Component or Set Property. EDIT: Solved this by creating a child game object with it's own collider and switching it on and off with Set Property when needed; so its more likely that there is an issue with Get Component. I just imported the playMaker actions for GameCenter into my project and got this error. I'm using Unity 4 with latest playMaker and GameCenter plugins. Assets/PlayMaker GameCenter/Actions/GameCenterConnect.cs(40,36): error CS0234: The type or namespace name `ConnectionStateDelegate' does not exist in the namespace `GameCenter'. Are you missing an assembly reference? Not sure if this is a Unity or playMaker issue, but my device tilting has been switched around since updating to Unity 4! Tilting forward and back now makes my player turn left and right. It should be noted that this occurs on my Android hardware build but not when using the Unity remote to test on PC. I haven't tested on iOS yet. I have checked my setup; everything should be working fine. I could change the axis that I'm using, but I'd rather not if it's a bug. Has anyone implemented a leaderboard system into their playMaker project? If so, could you recommend any solutions? Do you have separate leaderboards for Android and iOS, or does it allow for some cross-platform competition? I was thinking of trying the GameCenter plugin, but then I would need another solution for Android. How about OpenFeint? Is it possible to change the Render Mode of a light at runtime? I started working on some quality settings for my game and then realised that there was no property listed for Render Mode in Set Property. I need to do this because I require a movable dynamic light and the iPhone 4 just can't handle per-pixel lighting. I still want to give more powerful phones the option to use a per-pixel light, though. If this isn't possible then I will just have to create two versions of each light and toggle them... but being able to simply change the property would be far more elegant. Zombonic is a Tilt & Touch Shooter that pits you against an unrelenting horde of the undead. Shoot them before they can reach you and don't forget to watch your back! All game logic was created with playMaker. I'm not sure if this is a playMaker problem, an iTween problem, or a problem with the way I've set something up, but I'm getting all these messages spewing out on my console every time I fire an iTween Add or By action. Does this happen to anyone else? It doesn't seem to be causing any problems, but it sure is annoying! This doesn't happen when I'm using a Move To and supplying a Game Object as the target. I currently have a particle emitter parented under a character's armature which I want to turn on at a certain time. 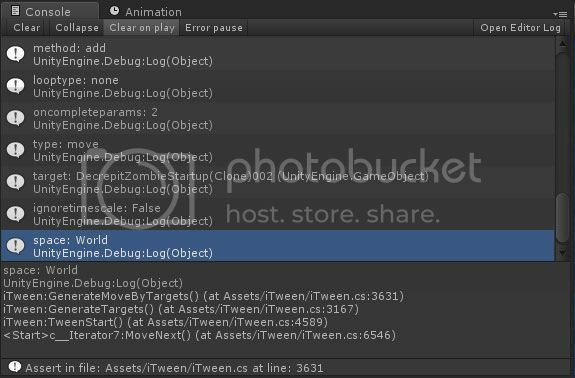 I'm using a SetProperty action on an object variable with UnityEngine.ParticleSystem but it isn't working! I've tried changing the property for enableEmission, isPlaying and playOnAwake, but it just wont turn on.